Saint Haralambos is the protector of Pyrgos and of its Metropolis of Ilia and Oleni. On the feast of the Saint on February 10th the people honor their patron not only through the church services, but also through organized cultural and folk events which create a festive atmosphere. The main event is the procession with the miraculous icon of the Saint through the streets of Pyrgos after the celebratory Divine Liturgy in the Church of Saint Kyriaki. 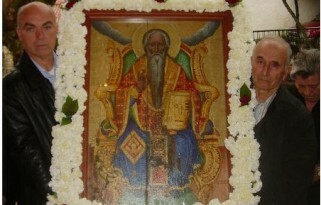 Saint Haralambos officially became the patron saint of Pyrgos in 1946. The small church dedicated to Saint Haralambos is just down the street from Saint Kyriaki Church and was built during Ottoman times by the Vilayet family, on the spot where the plague had ceased through the Saints' intercessions. The icon of St. Haralambos inside this church was donated by the same family in 1687 which they had brought with them from Vela. Currently a much larger church is being built to honor Saint Haralambos in Pyrgos. The reason Pyrgos has Saint Haralambos as its patron saint is because of the many miracles he has worked for the faithful in the area. Below is a list of the more famous ones. 1. In 1687 the Turks with their terrible leader, Ahmet Efendi, besieged Pyrgos. After supplications of the inhabitants to Saint Haralambos, a pestiferous sickness struck the army of the Efendi and many of his soldiers died, with the result being their withdrawal from the siege and the city being saved. 2. In 1821 the Turks entered the port and besieged Pyrgos in an attempt to head towards Tripolitsa and wipe out the revolutionary soldiers from the area. After they burned part of the city, they tried to head towards the center road with carriages and their weapons. However, outside of the small Church of Saint Haralambos, a small number of committed Greek soldiers were camped, who, with the help of the Saint, drove away the large number of Turks. Because of this the Turks would have to take other paths which would take weeks to reach Tripolitsa. The only pass that remained was the heroic Pousi, where the Greeks had organized, and as a result of the delay of the Turks at Pyrgou, the Greeks gave a fatal blow to the enemy. 3. In 1860 Saint Haralambos saved the inhabitants of Pyrgos from the terrible threat of plague. This sickness was disbanded by Saint Haralambos after fervent prayer and supplication towards him. 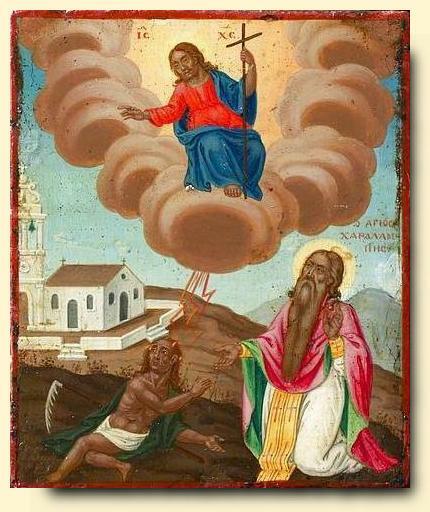 In fact the people of Pyrgos saw an astounding sight. The Saint with a staff drove away a white cloud like cotton into the sky until he threw it into the sea; this was the sickness which the Saint banished. And in other places also Saint Haralambos appeared driving away the plague, such as in Thessaly, in Savalia, and Demetsana, where they renamed the Church of the Entrance of the Theotokos after Saint Haralambos because of the wonderworking intervention of the Saint (the icon above depicts this event). 4. To Saint Haralambos is attributed the deliverance from the deadly threat of influenza in 1918, from Ilia and in all Greece, from which thousands of people were dying for months in Greece. 5. In the Italian bombing of 1941, a few hours before it occurred, a dense fog covered Pyrgos which resulted in the delay and eventually cancellation of the mission, and hence the salvation of the city. Before the Germans understood this, Pyrgos had prepared for the bombing. However, none of inhabitants suffered anything, because the bombs fell in uninhabited places and many didn't go off. This miracle was attributed to Saint Haralambos. 6. On March 26th 1993, a great earthquake hit Pyrgos at 2:10 p.m., divided into two quakes of 5.5 and 5.8 on the Richter scale, separated by a three minute gap, so the damage was not terrible. This dividing of the quake was a noteworthy scientific phenomenon. For a while before there were small vibrations at night, as a forewarning to the inhabitants to prepare for the time of the earthquake. At the hour of the quake, many small children with innocent eyes saw the “Pappou” ["Grandpa"], as they called Saint Haralambos, holding the homes of Pyrgos with extended hands so that they wouldn't fall. After the earthquake many inhabitants saw Saint Haralambos in their sleep relating that with his intervention the great earthquake was separated into two smaller ones, and because of this there was a procession of the icon of the Saint in the city.